Have you seen an Omar (Omarolluk erratic)? We need your help to track the transport and deposition of this distinctive erratic! Erratics are rocks that differ in lithology from the surface on which they are found. 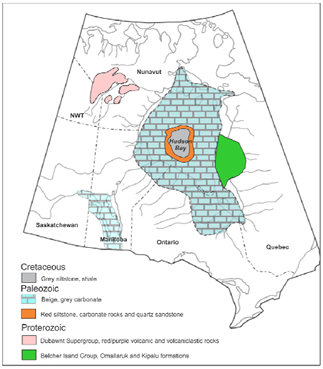 A distinctive erratic, found across parts of Canada and the northern USA, are fine-grained sandstones and mudstones (greywackes and argillites) with tan calcareous concretions or recessive holes from eroded (dissolved) concretions. These rocks are known as Omar erratics. 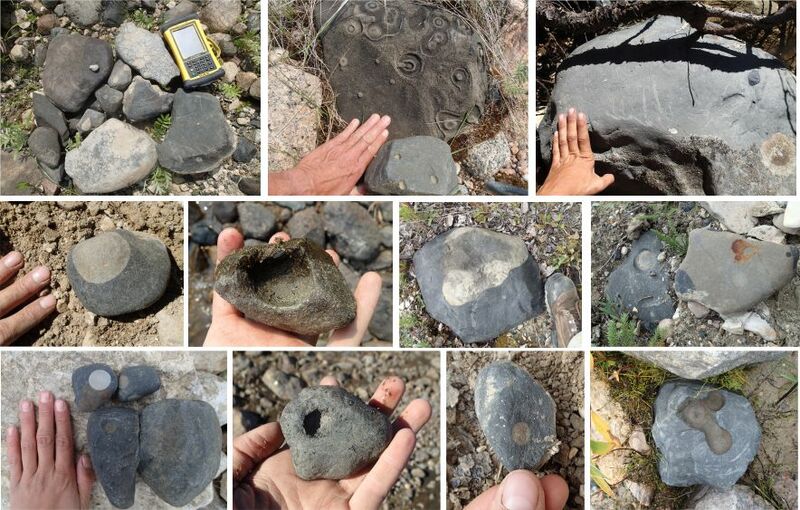 The following photos show examples of erratic clasts, interpreted as Omars, encountered during fieldwork in the Southern Indian Lake, South Knife River, and Gillam areas of northern Manitoba (click image to enlarge). These erratics would have been eroded from their bedrock outcrops by glaciers and transported within/beneath the ice into Manitoba. These greywackes are likely sourced from the Precambrian Omarolluk Formation of the Belcher Group, in eastern Hudson Bay. These rocks were laid down in thick turbitide sequences as part of a submarine fan (Ricketts and Donaldson, 1981). There are arenaceous, pelitic, conglomerate (which includes the concretions) and transitional facies. This means that the matrix texture of each erratic can vary, and that concretions are not always present. It is always possible that some of these erratics may have come from an area where the Omarolluk Formation has since been eroded away – and not just the Belcher Islands. The dispersal of these clasts is known to extend at least as far west-southwest as the Missouri River (Prest et al., 2000). These erratics can only have been transported into Manitoba from west- to southwesterly-flowing ice. In Manitoba, the dispersal pattern of Omars in the surface till reflect the movements of Quebec-Labrador ice during multiple glaciations. Omars are easily diagnosed as larger clasts, but are difficult to distinguish as pebbles, and can be confused with the local greenstone belt clasts, as the matrix properties are variable. Their presence has been noted, but not well-documented, and we are uncertain as to how far/where these erratics have ended up. Figure at right (click image to enlarge): Ongoing reconstruction of ice flow in Manitoba and surrounding areas. Data is compiled from numerous sources, and may not reflect the latest field-based interpretations. Stages are from oldest to youngest (a to d). The arrows are coloured randomly, and each color represents ice flow during one ice-flow phase. Can you help us in this study? Manitoba is very big and as scientists we cannot go everywhere in the province. We need your help to track the dispersal of Omar erratics across Manitoba. If you find an Omar - please report it! Trommelen, M.S. 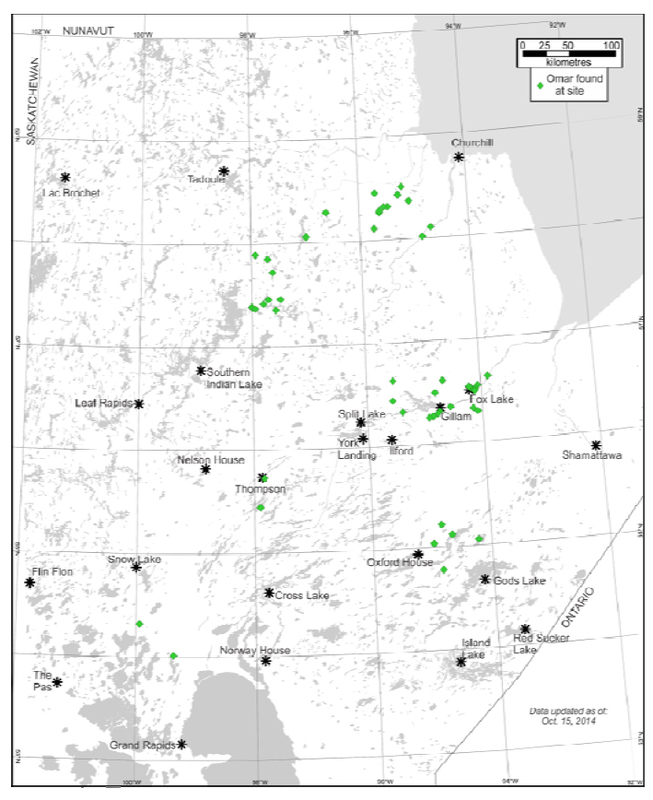 2013: Quaternary geology between Gauer Lake and Wishart Lake, north-central Manitoba (NTS 64H4, 5, 12, 13, parts of 64G1, 8); in Report of Activities 2013, Manitoba Mineral Resources Manitoba Geological Survey, p. 156-168. Prest, V. K., Donaldson, J. 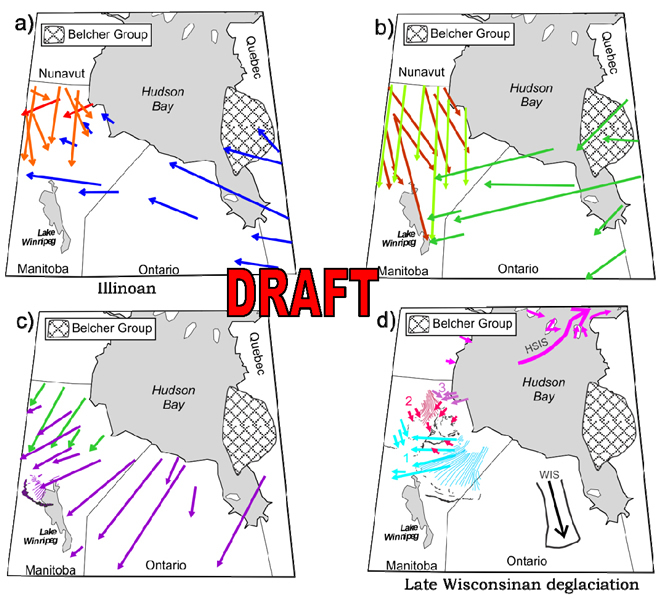 A. and Mooers, H. D. 2000: The Omar story: The role of Omars in assessing glacial history of west-central North America; Geographie Physique et Quaternaire, v. 54, no. 3, p. 257-270. Ricketts, B. D. and Donaldson, J. A. 1981: Sedimentary history of the Belcher Group of Hudson Bay; in Proterozoic basins of Canada, F. H. A. Campbell Geological Survey of Canada, p. 235-254.